Who Were Dennis Lee and Troy Reed? Dennis Lee and *F R E E * E L E C T R I C I T Y * ? 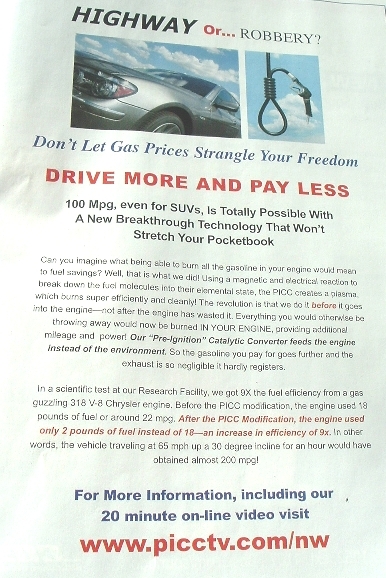 The Federal Trade Commission announced on Feb. 2nd, 2009 that "FTC Sues Promoters of Bogus Fuel Efficiency Device; Ads Appeared in Major Magazines Promising to Turn Any Car Into a Hybrid; At the request of the Federal Trade Commission, a federal court has temporarily halted the deceptive advertising campaign and frozen the assets of an operation claiming its device can boost automobile gas mileage by at least 50 percent and 'turn any vehicle into a hybrid.' The Commission is seeking a permanent ban on the ads and a further order providing reimbursement to customers who purchased the device. ... The FTC’s complaint was filed in U.S. District Court for the District of New Jersey against Dutchman Enterprises, LLC and United Community Services of America Inc. (UCSA). It also names as a defendant Dennis Lee, chief operating officer of Dutchman Enterprises and president of UCSA. Lee is a convicted felon who has been prosecuted in at least eight states in the past for violating consumer protection laws. ... The FTC asserts the defendants’ advertising campaign has used pseudo-scientific explanations to describe how their device purportedly works. For example, according to the papers the FTC filed, the promoters of the HAFC have claimed that the device uses electricity to turn plain water into “water gas” that has five times the potential energy of gasoline, and that it uses powerful magnets to ionize gasoline so that it burns more completely. However, in papers filed with the court, the FTC states that these and other claims defy well-established physical principles and contain 'gross errors and misrepresentations of fact.' According to an expert hired by the FTC, the device does not even meet the scientific definition of a 'fuel cell,' and several of the processes touted by the companies either are impossible or would lead to a net loss of energy. The promoters 'are marketing a product that cannot exist and function as claimed,' the FTC stated in the court papers. The Commission vote authorizing the staff to file the complaint was 4-0. ..."
High Mileage Devices - Where's the BEEF? From a letter sent by NMSR's Dave Thomas, to a New Mexico dealer of the HAFC "Hydrogen Assist Fuel Cell" technology, sent Tuesday April 8th, 2008: Hello. I'm Dave Thomas, president of a local science/skeptics group here in New Mexico. ... I'm writing because Eric Krieg has told me that you may be interested in getting an independent test of your outfit's purported 50% boosts in mileage with a $1000 Dennis Lee HAFC (Hydro-Assist Fuel Cell) kit. I would be interested in discussing such a test with you. Ideally, I think it should include starting with getting a fill-up (more than half a tank) at a given service station, topping it off there, then taking the vehicle out for a run of 100 miles or so, then returning to the same filling station and topping it off at the same pump (so as to get a decent measure of gasoline used). The resultant gallons used and mileage should allow for an easy calculation of miles per gallon. I've a mechanic friend, Rooster, who I would like to come along for the ride. He is quite interested in mileage-boosting technologies, and learning about driving techniques for same. I'm hoping that Rooster or I could be at the wheel during all/part of the test, if possible. Getting a test by an independent science group could go a long way toward getting your claims some good publicity, if the performance is indeed as advertised. Let me know if/how you want to proceed. Where is your facility located? Regards, Dave Thomas ..."
The response? THERE HAS BEEN NO RESPONSE. Perhaps the "test" was too difficult? While the ad makes no mention of Dennis Lee or UCSA, the web site DOES! The device was tested at "OUR Research Facility". Where is the Independent test? Why be skeptical of the PICC? One good reason is that it doesn't exist yet! "...The PICC is still under development but is expected to be completed and ready for market within a few months. In the meantime, the HAFC is ready to give you savings and prepare the way for the ultimate PICC Revolution. ..."
Another reason is that if most engines get around 30% efficiency, increasing this by 9 TIMES would mean 180% efficiency, 80% over the maximum possible! Hmmmm - where have we heard this before? "Over-Unity" is a SCAM! The 10th of July 2008 launch of Free Electricity - PENDING! "On July 10th 2008, with the support of 1.6 million people, we hope to have exciting demonstrations of such technology, in 120 football stadiums throughout America and Canada. ..."
The 10th of July 2007 launch of Free Electricity - CANCELLED! "'Jesus Power and Light' -- a free-electricity promotion denounced by scientists, consumer advocates and state attorneys general -- was pitched at an Akron City Council member's Sept. 5 ward meeting. The salesman, Fred Gissendaner, a respected local sports hero and community figure, believes in it so much that he says he has invested more than $10,000....Gissendaner says he is a certified dealer for the Hummingbird Motor & Sundance Generator, which purportedly harnesses the energy of permanent magnets to produce more electricity than it uses. But Gissendaner is not selling the generators; he's selling the DVD ($19.95 plus $7 shipping and handling) that explains the technology. Those who buy the DVD will be among 1.6 million 'witnesses' invited to football fields across the country (and in 10 provinces in Canada) on July 10, 2007, for the unveiling. After that, they will be entitled to free electricity for life by allowing a generator to be installed in their homes. International Tesla Electric Co. actually will own the generators and sell the excess energy back to utilities, Gissendaner said. 'This is nonsense,' said Lawrence M. Krauss, director of the Center for Education and Research in Cosmology and Astrophysics at Case Western Reserve University. 'Magnets do not give up energy.' Authorities in several states have warned consumers to be wary of theNew Jersey traveling salesman behind Gissendaner's investment: Dennis Lee. ..."
The 1st of May 2007 launch of Free Electricity - CANCELLED! "Our goal is to either have Plan A or Plan B during this administration. If we are allowed to recruit the necessary witnesses for Plan A before that deadline, then we will go for Plan A. If not, then we will not be having any football field demonstrations, nor will we care whether the media and friends do all they can to discredit us, because the entire society shall witness Plan B. If the intended reader of this message is able to do anything to assist us in being treated fairly in our efforts to gain the necessary witnesses for Plan A NO LATER THAN MAY 1, 2007, then we will be grateful and thankful to you for all you have done to protect the interests of all Americans...."
It's Deja Vu all over again! James Randi comments on Dec. 3rd, 2004 that "DENNIS LEE'S BACK — WITH A RELIGIOUS PYRAMID CLUB SCAM. Remember the nut case who has been promising a Free Electricity Generator (FEG) for several years now, who we described at several places like www.randi.org/jr/nov092001.html and www.randi.org/jr/102601.html? We long ago decided that for sheer nerve and ignorance, Lee was at the top of the 'chutzpah' list, and that's a very competitive category, folks! An anonymous reader tells us: 'Here is an update on what Dennis Lee is up to. He now has a new Christian ministry that he claims you can donate money to and it will be multiplied because he will be making those FEGs and selling electricity. But he can't demonstrate it until 1,600,000 'witnesses' are ready to see 100 simultaneous demonstrations across the USA at stadiums. ... The latest date Dennis predicts the witnesses will be ready is for shows on July 4, 2005. ..."
The 4th of July 2004 launch of Free Electricity - CANCELLED! "Is 2004 the year? God willing! ... BWT does not claim to have a Free Electricity generator and have not, to date, combined the Hummingbird to the Sundance. Due to the suppression of technology by Corporate America, BWT will not come forward until a critical mass of public awareness is achieved. Once 1.6 million people of North America has been registered for this program and agreed to be a witness at our demonstrations, BWT will produce 100 units to be demonstrated nationwide. These demonstrations will be held at the same time across America in sports stadiums and large public meeting places. ..."
various radio broadcasts, including one from March 18, 2004, "The Plan to Revolutionize Electricity in America"
The 28th of December 2002 launch of Free Electricity - CANCELLED! The 4th of July 2002 launch of Free Electricity - CANCELLED! "...Armed with an affidavit by a physicist familiar with Lee's free energy scams, the State sought a summary judgement. Lee made no attempt to counter the scientific arguments, objecting to the State's motion only on procedural grounds. Last Friday [September 27th, 2002], the judge granted the summary judgement against Lee, denying Lee a chance to bamboozle scientifically innocent jurors." "FRANKFORT, KY. (October 9, 2001) – Attorney General Ben Chandler announced today the arrest of Dennis Lee, an individual doing business under the name of 'United Community Services of America' and promoting a 'free electricity' scheme in a seminar held in Louisville, Kentucky, for violating state consumer protection laws. Mr. Lee also does business as 'Better World Technologies' and 'International Tesla Electric Company.'..." Dennis Lee LIES to New Mexican Audience! I attended Dennis Lee's "Free Electricity" seminar on September 17th, 2001, at the Crown Plaza Pyramid Hotel in Albuquerque. Before the show started at around 7:00 PM, a representative of the New Mexico Attorney General (AG) was passing out copies of a Temporary Restraining Order (TRO) to attendees. Once inside, Lee announced that he was also handing out "our" copies of the TRO, so I obtained one of those also (see below). Lee's copy of the TRO was the same as the AG's, with some minor differences. Just after 7:00 PM, Lee read parts of the TRO, noting especially the underlined portions, which stated that he was restrained and enjoined from "promoting...an opportunity to invest, pay or contribute any sum of money in exchange for the right [circled] to participate in... free electricity" and "taking money or any other thing of value... in exchange for participating in... a plan or scheme to generate and distribute free electricity...."
Lee told the audience he had the right to free speech, and to make contracts with citizens. He called the TRO "the most meaningless piece of paper you'll see in your whole life." He said he doesn't even come close to violating the TRO, and that his company doesn't do the things enjoined by the TRO. He said that no opportunity to invest was planned, and that his company GIVES away the opportunity to have a 30 kilowatt (KW) generator. He assured the audience that no money was required, now, or ever; nothing. He said "What do you pay? Nothing!" He said that was what the AG was trying to stop, and "The fact is I don't charge you anything for it." He said the TRO was "written by a 3rd grader," and complained that nobody from the AG's office was actually in attendance. Lee then launched into his demonstrations, which ran till midnight, at which time he allowed a short break. The show resumed, and was still going at 1:00 AM (9-18-01) when I left. The demonstrations included some easily-explained gadgets (such as a top that spins for hours atop a special electro-magnetic base, although Lee claimed repeatedly it was "all in the spin.") He also showed a demonstration of Lenz's law that involves a slowly-dropping magnet, which is well understood. He showed a gasoline motor running on a mixture of gasoline, water, Pepsi, Coke, pickle juice, hot sauce, sugar, salt, and other ingredients. He showed it was "pollution-free" by holding a white cloth to the exhaust tube; the cloth did not darken. I did notice the unmistakable odor of exhaust fumes in the closed hotel auditorium, however. He showed many, many items during the show; a "Brown's Gas" machine, a device which supposedly neutralizes radioactivity (this took over an hour to work, so other items were shown in the meantime), a power controller, a special buoy that can purify seawater, fire prevention powders and sprays, a fogger that quickly fogs up your house to stop burglars, mosquito magnets/killers, stove fans, oil-eating bugs, a quiet jackhammer, a flatless tire, and many more. He mentioned his company has 500 technologies they are working on. At 9:50 PM he again said he couldn't sell or let someone buy anything to give them an interest in a Free Electricity machine, but that he would give it away. He said he wanted to sign everyone in attendance up for a 30KW generator. He then demonstrated his supposedly efficient electrical generator, driven by a commercial (Balbour?) motor. His technicians measured the 3-phase input (22.8 KW) and output (17.7 KW), which he claimed showed 77% efficiency; he then stated that the commercial motor was itself rated as 77% efficient, and that his generator was thus shown to be 100% efficient. He then said said that if you took this 100%-efficient generator, and used it with the "Hummingbird" motor he showed here in 1999 (which he claimed could convert one unit of electrical power into five units of mechanical power), the new generator would convert the five units of mechanical power back into five units of electrical power, one unit of which could be used to run the motor itself, leaving four "free" units of power. That is "free" electricity, he said - you don't have to pay for it. He said he could not demonstrate the units actually working together because the last time he did something similar in public, in 1988, he was arrested, and his equipment was confiscated. He went on for quite a while about how his co-workers (witnesses) at that time were intimidated with death threats, and how he served two years in prison. He said he was set free only when he demonstrated in a court of law that he could extract energy right from the air. He said the 100%-efficient generator was the "peanut butter," and his Hummingbird motor ('99 demo) was the "jelly," and challenged the audience to decide if they can make a [peanut-butter-and-jelly] sandwich. He then demonstrated five more technologies he is not selling yet. After these, he finally got around to telling us how we could get our own Free Electricity. He said he was going to install and demonstrate 100 working Free Electricity units on the same day, perhaps by the end of the year, and probably at least by March 2002. He wants to demonstrate 2 working units in each of the 50 states (for 100 units), and wants 1.6 million witnesses, because there is no way they would put that many people in jail, and that it was the only way for him to demonstrate the Free Electricity machines without being arrested. Lee described this event as similar to 100 Woodstocks on the same day. He said the 1.6 million witnesses must do a job; it didn't involve money; they simply had to agree to be a witness at one of the 100 Free Electricity demonstrations. Lee said his dealers need to sell products, like videos, to make their money; the money is used to pay for advertisements and such. Lee said he gets ZERO dollars from the dealer signups. He said "You sign up for free," and that after he gives Free Electricity (FE) generator units to the 1.6 million witnesses, they will each receive certificates which will allow nine of their closest friends to purchase their own FE generators at $1000.00, which covers the cost of the generators for the witnesses ($9000 each). Lee then said this income would fund him to build more generators, which he would sell, and that he would also sell the excess power back to utilities and other consumers (the state of Israel was mentioned) at 5 cents per kilowatt-hour, generating billions of dollars in revenue for Lee, while simultaneously driving coal and nuclear power plants out of business. This scheme would take 5 years to complete, which would give the power companies 5 years to find other methods of income. Lee said he has to work through his dealers, and that all technologies are purchased from them; they are like his family. They have expenses that must be paid, so the NASDAC Discount Buying Club was formed. He said this had nothing to do with Free Electricity. You can join the NASDAC with a one-time $15.00 fee, for which you get discounts on his technologies (such as the laundry balls which are claimed to eliminate the need for detergent). Once you join the NASDAC, Lee said, THEN, for FREE, you get the registration form to sign up for Free Electricity. He said you could get the $15.00 BACK as soon as you bought any products, via the NASDAC club discounts on normal (non-member) prices. He then described methods by which NASDAC members could make 1,300$ per year for life, simply by making a one-time $150.00 "donation" to churches which have agreed to use the donations to give 10 of their church-goers NASDAC memberships. This was supposed to happen via a 10% commission on sales by the recruited church members, which goes to the person making the $150 "donation." By this time (1:00 AM), I realized that, contrary to Dennis Lee's repeated assertions throughout the evening that he was NOT in violation of the Attorney General's TRO, I could NOT get registered to be a witness, and get my own Free Electricity generator, without having to spend some money. So I left, before the end of the show. In the hall outside the auditorium, two representatives were still on hand to take applications. New Mexico State Board of Education member David Vickers, whom I know as a fellow resident of Valencia County, was manning the tables at the beginning of the show, and through midnight or so, but he had left by this time, or was inside the show still. I should add that Mr. Vickers did not make his public official status evident to audience members, or appear to use this for credibility. (Small wonder - inside, Dennis Lee was describing ALL public officials as "corrupt.") Vickers told me earlier in the evening that he was going to put one of the reactors on his car that would make his car work on 20% gas and 80% water, and invited me for a test drive, which I accepted. I told the two remaining table staffers (one female, one male) that I would very much like to be a witness to the first demonstrations of this incredible technology (100 systems in 50 states on the same day), but that I didn't have much disposable income, and asked if there was any way I could sign up to be a Witness (and thus get rights to my own Free Electricity generator) without having to also join the NASDAC discount club. The representatives told me that only the Dealers could give away the Free Electricity certificates to potential witnesses, and that they only gave those certificates to NASDAC members. I asked if there was a list of dealers in the area, and they said there was not, but that I could call the toll-free number to find a dealer near me. Dennis Lee clearly violated the terms of the TRO. Even though he said many times that he was not violating the TRO because he was giving the FE opportunities away, I found that there was simply no way to get signed up for this opportunity without parting with at least $15 to join the NASDAC club. 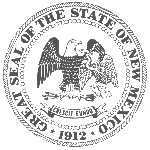 Dennis Lee lied to me, and to over 250 New Mexicans. This made me quite upset, quite independently of the fact that his Free Electricity devices are never going to work, because they clearly violate the Second Law of Thermodynamics. I wanted to be a WITNESS to Lee's demonstration, a demonstration which it is all too painfully obvious will never occur. The show was filled with standard Lee-isms too numerous to be detailed here, but which have been described elsewhere many times - constant appeals to God and Jesus, claims that his devices work "even though no one knows how," and on and on and on and on. Check Philadelphia skeptic Eric Krieg's extensive Dennis Lee page (and mirror page) for the latest on this and other tours. 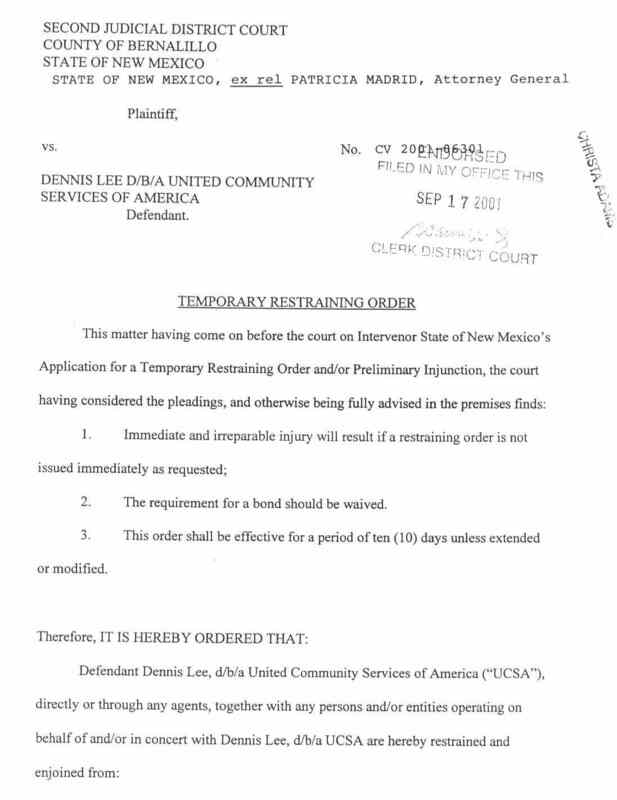 ATTORNEY GENERAL MADRID OBTAINS TEMPORARY RESTRAINING ORDER AGAINST PROMOTER OF "FREE ELECTRICITY"
(Albuquerque, NM) Attorney General Patricia Madrid today obtained a temporary restraining order against Dennis Lee, promoter of a "free electricity" scheme. Lee is scheduled to promote the scheme in a seminar this evening in Albuquerque. "I do not want to see consumers in this state lose money in this fraudulent scheme. During his presentation tonight, Lee will be restrained from talking about investment in his schemes or from taking money. Should Lee choose to violate this restraining order, he will find himself in contempt of court and facing a potential fine," Attorney General Madrid said. Lee has toured the United States demonstrating numerous devices that are claimed to produce more energy than the devices consume. Lately, Lee has been conducting promotional events around the nation, typically offering one seminar per state. On his web site, Lee states the objective of the current tour is to register 1.6 million Americans and Canadians into the free electricity program. "Mr. Lee is selling the promise of a product that does not exist. The complication is that scientists believe such a product is just not possible. I do not want to see New Mexicans duped by this scheme. As chief law enforcement officer, it is my duty to protect citizens from those who would take advantage of them," Madrid said. The states of Vermont, Washington, Oregon, Alaska, and Maine have taken legal action to prevent Lee from promoting his "free electricity" investment scheme. Lee, believed to be a resident of New Jersey, does business as United Community Services of America (UCSA) and International Tesla Electric Company (ITEC). See attached statement from a scientific perspective by physicist Dave Thomas about Lee's claims for free electricity. Statement from a scientific perspective by physicist Dave Thomas about Dennis Lee's claim for free electricity. Dave Thomas received bachelor's degrees in physics and in mathematics from New Mexico Tech, as well as a master of science degree in mathematics. He has been employed as a physicist for 20 years. The "Free Electricity" devices marketed by Dennis Lee and associates at Better World Technologies and other corporations can not possibly make homeowners totally energy (electrical) independent as Lee claims they can. This would violate some of the most fundamental and well-tested laws of science, the laws of thermodynamics. Saying that "free electricity" is impossible is NOT similar to pronouncements from a few scientists of old that, for example, heavier than air machines (airplanes) could not possibly work. These speculations were disproved by real experiments, such as those of the Wright brothers. 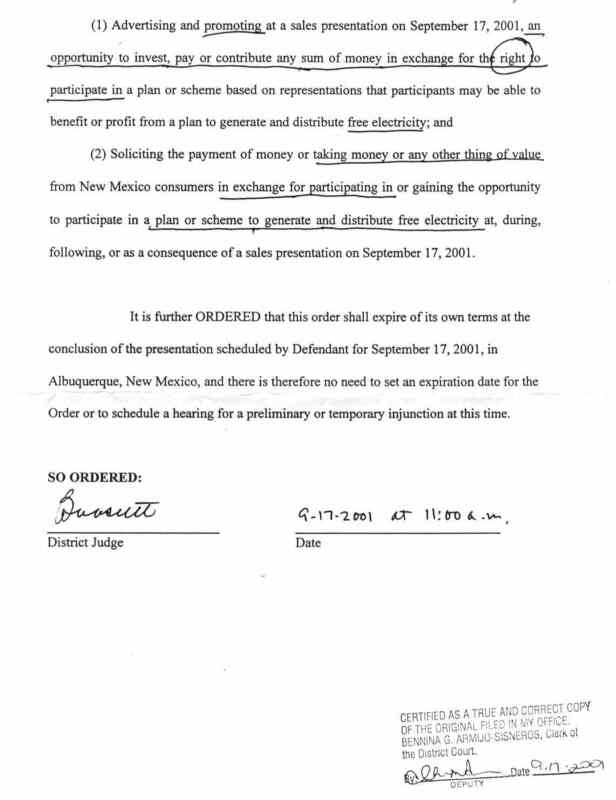 If Lee could actually produce devices that make "free electricity," he could easily demonstrate this, not with separate bits and pieces (or "peanut butter and jelly," as he called them in his 1999 visit to New Mexico), but simply by displaying a stand-alone generator that could run itself, along with other devices (lights, washing machines, etc.). This device would need no external power; it would not need to be plugged in to the wall. It would need no gas tank, as many conventional generators use. If it used batteries, it should be able to supply many times the energy capability of those batteries for indefinite periods of times (days, months, years). Such devices are indeed impossible, and that explains why Dennis Lee, despite his promises, has yet to actually demonstrate such a device anywhere, at any time. Lee claimed to show a device that "doubles output power" here in 1999, but he included enough information to make it evident that all he really did was to change the configuration of his device from one that wasted over 90% of the input power to one that wasted only 75% of the input power, producing what appeared to be a "doubling of output." Lee fills his shows with irrelevant and misrepresented science demonstrations to impress his audiences, but these are all unimpressive upon serious examination. For example, Lee claims to have developed "special magnets" that can make non-ferrous materials (aluminum) into ferrous ones (iron), but the spooky-looking slowly-dropping magnet inside the tube that he shows is easily explained and demonstrated with ordinary materials (aluminum tubes and strong rare-earth magnets). The effect is simply due to eddy currents and Lenz's Law, but you will not hear that explanation from Dennis Lee. In fact, this very same demonstration is commonly used in many college physics courses. "Tired of High Electric Bills ...How About NO Electric Bills? This Machine May Give You FREE Electricity For the Rest Of Your Life ..."
Sounds too good to be true? It is. It's just Dennis Lee's pitch at the Albuquerque Convention Center the evening of October 28th. We estimate that there were about 200 people in the audience. This show was one of a 45-city nationwide tour, ending in Philadelphia on November 10th. Lee was last in Albuquerque in February, 1996, when he was pushing a another "free energy" machine, the "Fisher Engine." See NMSR Reports, Vol. 2, No. 3 (March, 1996). Once again, Lee, who claims to be the Director of Research for Better World Technologies, dominated the show, speaking nonstop from a wide, raised platform cluttered with his demonstration equipment. He talked from 7:00 PM to after 10:30, allowing questions up till 11:00 PM. Although there were hand-lettered signs saying "No video cameras" on the Convention Center doors, Lee allowed a camera from a local TV station to film his presentation, but said that he wouldn't give an interview. And he asked the audience to hold their questions until the end of the show. Early in his talk, Lee said, "The primary thing tonight, probably of interest to you, will be that literally every person in this room will have the opportunity tonight to be able to sign up to disconnect from the electric utility grid and never pay an electric bill again as long as you live. ... I'll show you tonight we'll give you a unit that we are proposing for use on your house that will give the power -- 100% of your energy. ... Tonight we're also going to show you we can run car engines, truck engines, any internal combustion engine, on water. ..."
Lee mixes religion with his pitch, referring to God as the "Chairman of the Board of our Company," claiming that under God "all things are possible," and even offering a prayer for wisdom and to put the words in his mouth that "You would have me speak to Your people." Lee says he doesn't like the word "impossible." He says that, if you go to a physicist and say that you've got a free energy machine, the physicist will say, "That's impossible," because, as far as what he knows, that is impossible. Lee said, "I have to admit to you right now that I have never witnessed a free energy machine in my entire life. ... I have never witnessed a free electricity machine in my entire live. I have never built one. I don't know if I ever will build one, but in pure physics terms, I have never witnessed such a thing. ... According to the conservation laws, free energy using physical terms, in physics, seems to be pretty impossible." Despite this seeming disclaimer, Lee went on to talk of free energy sources, such as wind and solar energy. In his talk, Lee says that scientists have a lousy track record in determining what's impossible; for example, "heavier than air flight is impossible." Lee claims that the Wright brothers were flying for five years before scientists witnessed it. And he says that they couldn't get reporters to come to their flights and "so what they did was they went downtown and they flew about the second floor level where the newspaper staff worked -- the second floor of the building. So they just flew right alongside of the window on the second floor of the building. Now the reporters would cover the story. [But] the newspaper reporters got up and pulled the shades down." Lee claims that, for five years, ordinary people wrote to the President of the United States, Teddy Roosevelt, telling him that the Wright brothers were flying heavier than air machines until Roosevelt ordered scientists to go down and witness the flights. The moral of Lee's fantasy is that the common people have more common sense than highbrowed scientists and that -- just because scientists say that something is impossible -- it might be possible after all. And, sadly, many in Lee's audience believed every word. Lee says that, when he talks of "Free Energy", he means energy that you do not have to pay for, such as photovoltaic cells and wind machines. Lee went on to extol the virtues of "burning water." First, one extracts the hydrogen and oxygen from the water by electrolysis, making a "Brown's Gas" which consists of two parts hydrogen and one part oxygen, and then you can use this gas as fuel for an internal combustion engine, or as fuel for a cutting torch. And, of course, the combustion product is water, just like the water you started with. Lee claims that this gas mixture is economical to make and the least expensive gas that you can buy. He asserts that, using this gas, you can cut through three-inch thick steel for a full hour using only seventeen cents worth of gas. And to top off the amazing power of this gas mixture, Lee asserts "Believe it or not, this gas can also be used to transmutate [sic] the nucleus of an atom. That means that we could literally take all of your atomic waste and we could neutralize it." In another demonstration, Lee holds up what he claims to be a 1-horsepower AC electric motor with a light cardboard disk attached to the shaft. He makes some connections and the disk starts rotating. He then shows the power source -- an ordinary nine-volt battery, like those used to power transistor radios and similar small electronics. His clear implication is that, since the shaft was turning, he gets one horsepower from a nine-volt battery! Lee goes on and on, demonstrating a "brain for motors"; a "Y2K Lamp" which, using an internal battery, gives the light of a 60 Watt light using only 13 Watts of power for eight hours [i.e. an ordinary fluorescent lamp]; and an LED flashlight which he claims runs for 470 hours. All of these wonders are relatively conventional devices. Lee then talks about the Y2K threat and the fact that the National Guard might be called out in the event of major power disruptions, which he says would actually be deliberate power failures. The real purpose, he says, would be to confiscate your guns! He then goes on to endorse the right to bear arms and says that, if the people can outgun the military, then they would be safe from such conspiracies. He asks if we know that a representative from General Electric serves on the Board of Directors of EVERY electric company? Lee calls Nicola Tesla the "greatest scientist who ever drew breath" and claims that Tesla patented radio before Marconi demonstrated it. He says that Tesla invented "di-electricity", the exact opposite of normal electricity. Lee asserts that while normal electricity is carried by wires and creates EMF (which he calls "electromagnetic frequencies"), di-electricity travels through insulators, such as air, and generates no EMF at all! Lee says, "As a matter of fact, there is no instrument made by man that can measure the passage of di-electricity through the air." He claims that, about 100 years ago, Tesla talked with J.P.Morgan about transmitting electricity utilizing the "positively charged ionosphere"! because I have to find a scientist that wasn't a whore." After demonstrating that a Tesla coil can light a fluorescent lamp with only one wire connected to the lamp [his body providing the necessary capacitive ground], Lee asserts, "By the way, did you know that Nicola Tesla passed live electricity from Colorado Springs, Colorado, one hundred years ago he sent electricity twenty-six miles to a little patch out in the ground twenty-six miles away -- just stuck in the ground, no wires whatsoever, and he sent live electricity twenty-six miles. Do you know how efficient it was? Ninety-nine point nine percent efficient! ... Now, I have a challenge for any electric company, or any of you who work for an electric utility company: if you can take a wire today -- whatever wire you want to use -- and you can take 2,000 kilowatts of electricity twenty-six miles, and you can get 99.9 percent of it there, over that wire, I'll give you $10,000 cash. My money's safe, because you can't do it. ..."
Lee goes on to call gravity a "free energy source." He then displays a small permanent magnet and says, "I now set it on a piece of metal and it no longer responds to gravity, it still has weight, mass and volume, but what is happening now is we're getting a flow of energy -- a flow of energy is flowing through this magnet to this metal and so it is constantly flowing this energy and constantly being replaced. It never runs out. It will last forever. ... there's no charge for this at all -- it's free energy. ... For this source of energy is readily available everywhere, all the time, constantly working, continually replacing itself and it never, ever ever, gives out. And it doesn't cost anybody a dime. ..."
Lee then performs the most entertaining stunt of the evening when he drops his little magnet vertically down a thick aluminum tube and observes that it takes about four seconds for the magnet to pass through the approximately 18 inch long tube. He then repeats the stunt with a copper tube and it takes about six seconds for the magnet to clear the tube. Of course, there is no mystery here; the falling magnet induces a current in the tube which, in turn, generates a magnetic field which retards the falling magnet. Lee then claims that he has achieved superconductivity at room temperature and shows a video clip of a magnet floating on a magnetic field -- essentially the same kind of toy one can buy from novelty stores or from Edmund Scientific. Nothing is shown which demonstrates that the supporting magnetic field has anything to do with superconductivity. Lee says, "unfortunately for us, we don't live in a free society....In 1988, I proved that I could make an energy machine that takes energy out of the air and makes electricity for free. I did that in 1988." He says that he called a public meeting for some 600 people to demonstrate his machine, but the sheriff arrested him for fraud and hauled away all his equipment. He then asserts that, in 1989, he proved in a court of law that he could generate electricity for free and he claims that some twenty-seven witnesses were coerced by the sheriff not to testify on Lee's behalf. He claims that all the criminal fraud charges against him were dismissed. Lee is now understandably cautious about claiming that he has a free energy machine and he now coyly says, "So tonight, I'm going to demonstrate for you my peanut butter and I'm going to demonstrate to you my jelly. So how am I going to demonstrate peanut butter and jelly tonight? ... So tonight I'm going to show you my peanut butter; and tonight I'm going to show you my jelly. And after I show you my peanut butter and my jelly, then you can determine whether or not you think I should put these two components together and make you a free electricity machine. ... The next time you see me will be on your lawn, installing a peanut butter and jelly sandwich on your lawn. ... This is it. The next time will be free electricity time in your house and your house will be disconnected from the grid. ..."
Lee states his "Fourth Law of Motion": "For every action, there is a reaction which can be fed back into the action." He then introduces the basis of his free electricity claims, the counter-rotation machine. This appears to include an electric motor in which the rotor turns as is normal, but the stator is also allowed to rotate, in the opposite direction. Before he demonstrates his large counter-rotation device, however, Lee demonstrates a scaled-down version in such a way as to make it appear that the output power is doubled for free. Lee operates the small machine in "normal" mode (with the stator unable to counter-rotate), and reports the following measurements (made earlier at his "lab"): input voltage = 13V, input current = 15.5A, input power (= 13V*15.5A) = 201 Watts, Torque = 6 inch-Lb, and speed = 219 RPM. (For this setup, the output power is energy/time = torque * angular speed; for torque in inch-pounds, and speed in rpm, power in watts is given by 0.0118*torque*speed. Here, the output power is 0.0118* 6 inch-lb*219 rpm = 15.6 Watts, much less than the 201 Watts of Input Power.) Lee then unlocks the stator, allowing it to counter-rotate, and reports the following measurements: input voltage = 14V, input current = 12A, input power (= 14V*12A) = 168 Watts, Torque =7.5 inch-Lb, and speed = 438 RPM. (For this setup, the output power is 0.0118* 7.5 inch-lb* 438 rpm = 38.8 Watts, again much less than the 168 Watts of Input Power.) Assuming that the difference in RPM corresponds to a difference in output power, the machine appears to be producing more than twice the power for a slightly lower input power. It's true that the output power in the "counter-rotation" configuration, 38.8 Watts, is two-and-one-half times larger than the output power in the "normal" configuration, 15.6 Watts. Lee was careful not to mention the actual output powers (15.6 Watts, 38.8 Watts). Rather, he focused on how his counter-rotation setup doubled the power for "free." But the actual physics of this "phenomenon" is painfully obvious. The efficiency of the motor in the "normal" configuration is output/input power, i.e. 15.6 Watts/ 201 Watts = 7.7%, while the efficiency of the motor in the "counter-rotation" configuration is 38.8 Watts/ 168 Watts =23.1%. Lee has made an extremely inefficient motor more than twice as efficient as before; but it's still a very inefficient motor. Lee is not making "free electricity" -- at best, his device loses less power in one configuration than in another. Lee goes on to demonstrate a large (four-foot tall) counter-rotation machine, but for this one, he mentions neither torque nor output power, and again concludes that doubling of the rpm's at similar input powers is the result of harvesting "free" energy. Table 1. Lee's "Counter-Rotation Device" APPEARS to double the Output Power (from 15.6 Watts to 38.8 Watts), BUT all that's really happening is that the "Counter-Rotation" Configuration Wastes 76.9% of the Input Power, versus 92.3% Wasted for the "Normal" Configuration. Lee says that it's not unusual for a motor to be 75 percent efficient. If he couples that motor into his counter-rotating device, then he claims that it will be 150 percent efficient, in effect its output power will be greater than its input power! Lee calls this his "peanut butter." Lee then introduces his "jelly" -- a DC motor which he claims is "the most efficient electric motor that has ever been built since the dawn of civilization." It's a small motor powered by a battery which produces 94 Volts and generates 10 horsepower. Lee connects leads from the motor to an oscilloscope and shows spikes on the oscilloscope display which he claims indicates AC power flowing back into the battery. (Actually, it's far more likely that what Lee is seeing are inductive voltage spikes resulting from the motor's commutator action.) The motor is connected to a dynamometer which measures 3.1 HP (2313 Watts). The input power is 5.68 Amperes at 94 Volts or 534 Watts. This corresponds to an efficiency of 431% -- clearly, something is wrong! Assuming that the voltage is approximately 94 Volts, then either the current reading or the dynamometer readings are wrong. Independent measurements made at the October 19th show in Portland, Oregon, showed input power of 2,576 Watts (26.4A x 96V + 3.2A x 12V) for an output power of 2.2 HP (1,641 Watts) corresponding to an efficiency of 64%. This result suggests that the input current reading of 5.68 Amperes, based on the voltage drop across a 0.001 Ohm shunt, is probably wrong. But Lee says, "If you've got one unit of energy going in, you got four units of energy going out, how is that possible? Well, that is NOT possible." "However," Lee says, "what if you had five units and four units of energy going out, one of those five units of energy was the power from the battery and the other four units were coming from this baby right here. This is a permanent magnet motor. ... We exploited the power that is sitting right there in permanent magnets all the time. ... The power, of course, is coming from God, from the electromagnetic force field of the earth which is unlimited in its potential. ... And, of course, there's no charge for it at all." So Lee proposes taking one unit of power from the output and using it for the input while using the remainder of the output power to generate electricity. In effect, he's proposing a perpetual motion machine with available output power! Then Lee says, "I am not representing this as a free electricity machine. This is not a peanut butter and jelly sandwich. I can't make you a free electricity machine. ... It is not being represented as a free electricity machine; we show you what one is going to look like when we do put that under your house." Lee asserts that his machine can generate 50 Kilowatts of power "all day, all night, all decade, all the rest of your life. Fifty Kilowatts every hour all night long, all day long." This is far in excess of the typical household power needs, and so Lee says, "So maybe you want to be a good neighbor; you put this one on your lawn, you have a wire to the neighbor to the left of you, you have a wire to the neighbor to the right of you, you run a wire to the neighbor behind you, you run a wire to the neighbor in front of you, and you just give some other good people in the neighborhood some power as well. Now, if you want to do that, as long as you don't tell me anything about it, go ahead and do it. I don't care what you do with it. ... When I install this unit on your house, I will never ever ever for the rest of your life come by and poke my nose in your business and read your stupid meter. This means that I will never ever ever send you an electric bill, because you won't get a bill. Bills are a thing of the past; you won't have electric bills." Lee says that he will have a 20-year battery by next year and, "I'll put that one into your car. I'll put some cells into the gas meter [?] of your car. You'll be running down the road, you get in at night, you plug your electric battery into this unit and it charges the battery at night while you're asleep. And you get up in the morning and you take your water hose, fill up your tank....And then you just turn that thing on and you can drive 400 miles absolutely free using your free electricity machine and water gas." Lee says that you can use your Electric Utility Company as backup, just pull a switch down to switch to Utility power and call International Tesla Electric Co. (Lee's company) to service your electric machine -- free! And ITEC will reimburse you for the power you use from the Electric Utility, too! How much will this cost you? Only $275, even though Lee claims that the machine costs him $3,000. Lee claims that he has a commitment of "well over one billion dollars" from his financial backers. He says, "I am a Christian....My God said before I go revolutionizing the electric industry, to go around to all of you and give you the chance to get set free of the grid. Once I circle the whole United States of America and I've landed back on my end, who ever wanted to be free of the grid will be free of the grid; whoever doesn't it's perfectly OK -- they'll have to get free of the grid, 'cause I'll need a lot of customers to sell electricity to after that anyway. So, this is a offer that is coming to you from God, and I'm going to [tell] you exactly how it works....He [God] said, `go find fifty people who want to be set free of the grid and every fifty people that you find -- form them into a cooperative.'" Lee says that, if you'll fill out his papers and send them in (along with your $275), you'll automatically be formed into a 50-person cooperative. Lee says that he will put twenty of his energy machines on an 8' by 40' flat bed trailer to generate 10 Megawatts. He says that he can pull one of this trailer up to an Electric Utility substation and provide enough power for some 5,000 homes. Lee says that he will kill every coal- and oil-fired plant in the next two years, because he can sell power for 5 cents/Kilowatt. He says that the State of Israel will buy all the power he can supply at 5 cents/kilowatt. And Lee has fourteen nations lined up to buy power, providing that they nationalize their power systems. Talking about the 50-person cooperatives, Lee says that he will build one by the end of the year and put in about 100 units. In New Mexico there will be 100 units -- one in every co-op -- working, free energy machines. Each unit will generate 15 Kilowatts. The co-ops will loan Lee's company $10,000 to build a power trailer. He says that everyone will be set free from the power grid by March, 2000. Then Lee will pay back your loans. Lee winds up his talk by claiming that he will be eliminating all pollution -- fossil fuel, and etc. He lists some of the 500 technologies his company is developing, such as the camera which looks inside a person's body without using x-rays or any other radiation that can revolutionize medicine, a silent jackhammer, and a telephone which allows telephone conversations anywhere in the world without using satellites and without cost. And, of course, Lee offers dealerships for about $10,000 each to push his free energy machines. In summary, Lee's show is a strange mixture of hokey science, hucksterism, paranoia, religion and megalomania, designed to separate the gullible from their money in return for the vain hope of "free energy" and freedom from the clutches of the "Electric Utilities." Clearly, Lee is making money -- travel costs and rentals for a 45-city tour do not come cheap. And a full page ad in USA Today, like the one Lee ran on Sept. 17th, 1999, costs over $80,000 last time we checked. One wonders how long Lee will be able to get away with it. His investors will surely not get a warm feeling when they get around to reading the fine print in the application to join a co-op, in which it is stated that Lee's Better World Technologies "is at a late stage in the development and possible production of an up to 15 kwh free electricity generator to be applied to residences...." (emphasis added). NMSR thanks the Philadelphia Skeptics, Eric Krieg, and Tom Napier, for advance information on Lee's visit and tactics. See their great Lee website here (and mirror page here). Visit Dennis Lee's United Community Services of America website here. Review of Dennis Lee's 1996 New Mexico "Greatest Energy Show"
The days of snake oil salesmen aren't over yet. On February 26th, 1996, I attended "THE GREATEST ENERGY SHOW ON EARTH!" at TVI's Smith-Brasher Hall. The flyer said, "Unlimited energy is available to power all moving vehicles without gasoline or diesel [sic] and with no pollution at all! . . . See how we can make electricity for free from energy taken from air even at night in a snow storm." The show was presented by Dennis Lee ... Lee appeared on at least two radio talk shows (Chris Jackson, KHTL 920 AM and Jay Howard Deme, KOB 770 AM) to plug his show. Lee, who admits to no training in science or engineering, spoke for four hours to a standing-room only audience. He says he is the Director of Research for Better World Technology (BWT) of Newfoundland, New Jersey. His Albuquerque show was one stop on a 12-state tour which ended in Washington, DC on March 5, with a show to which he invited the President, Congress, the Supreme Court, the IRS, the Pentagon, the FBI, the CIA, the Department of Energy, etc.! His show was a non-stop rambling mishmash of pseudoscientific babble and sales pitch. He says that "the energy in magnets is continually being replaced" and asks, "what is that power source?" He says that "we can solve all forms of pollution today," and "that there is no reason to burn fossil fuels," and "if you have a perpetual energy source, you have a perpetual motion machine." He asserts that "I developed the world's most efficient solar energy system!" He described the use of low boiling point gases, such as Freon, to collect solar energy and provide sufficient energy to heat a house, provide electricity, and even provide surplus electricity to sell to industry. His solar panels are 8 feet long and 3 feet wide, used four at a time in an 8 by 12 foot array. He claims his system produces "28,000 kilowatts in a year of free electricity" [kilowatt-hours?]. He says he can build such a home system for $2,500 and that the homeowner will have free power for the rest of his life. Of course, these types of devices are absolutely impossible according to the 2nd Law of Thermodynamics, which was stated in the following manner by Lord Kelvin: "It is impossible to devise a process whose only result is to convert heat, extracted from a single reservoir, entirely into work." The device Lee claims to have developed would constitute a perpetual motion machine of the 2nd kind (as opposed to the 1st kind, which would violate the 1st Law, conservation of energy). He went on to describe the "Fisher Engine," a heat engine with no exhaust and no condenser, saying that the steam engine, in use for some 200 years, "was built wrong." He showed a slide of a "Fisher Engine" with a 6-inch cylinder, which he says develops 80 horsepower. He claims that he can adapt any conventional automobile to use this engine, and that it will then run for 400,000 miles with no oil changes. Lee demonstrated a Chrysler automobile engine modified to use compressed gas as a power source, using only two cylinders. He said he used carbon dioxide (CO2), rather than Freon, because his modified engine didn't have a condenser and he couldn't legally vent Freon. He quoted the torque generated by a normal Chrysler engine (about 150 foot-pounds) and then demonstrated the torque produced by his modified two-cylinder engine by attaching a torque wrench to the crankshaft and opening the valve of the CO2 bottle. The torque wrench was destroyed, to the delight of the audience, demonstrating a torque far, far in excess of that nominally generated by such an engine. "Think of the power this engine would have if we used all of the cylinders!" he said. He then removed the wrecked torque wrench and let the engine run unloaded for a few noisy seconds. Setting aside the fact that Lee confused torque with power (as he did force and power throughout his spiel), let us do a back of the envelope calculation of the torque we might expect from his engine, considering only a single cylinder. The gas in a CO2 bottle at room temperature (20°C) consists of liquid and gaseous CO2 at a pressure of about 830 PSI. If the piston diameter is 3.4 inches, its cross section area is 9.1 square inches. A pressure of 830 PSI on this piston would result in a force of 7536 pounds. If the stroke length is about 4.1 inches, then the torque (when the crankshaft arm is at 90°) is around 1287 foot-pounds. No wonder the wrench was destroyed! Of course, this is irrelevant to the question of how much power Lee could generate using a Freon-based heat engine -- even a "Fisher Engine." It was just a flashy demonstration to impress his audience. While in prison, Lee claims to have developed a "Hot Box," a cylinder about 4 inches in diameter and 18 inches long (and thus with a volume of about 226 cubic inches), which can store 200,000 BTU and which can be used to power automobiles, etc. He claims to be working on a new liquid with a "super-high heat capacity of 2,000,000 BTU per pound." One BTU (British Thermal Unit) is the amount of heat needed to raise the temperature of 1 pound of water by 1°F (1 BTU is equivalent to about 1054 Joules, or 1.054 Kilowatt-seconds). Now, the density of water is equivalent to about 1 pound per 27.7 cubic inches. Thus, water in the Hot Box volume of 226 cu.in. would weigh about 8.16 pounds. 200,000 BTU in 8.16 pounds of water corresponds to a temperature of 24,700°F (or 13,600°C) -- hot water, indeed! (Tungsten boils at 5,927°C and quartz at 2230°C.) Filling the "Hot Box" with any other material, such as sand, would correspond to even higher temperatures. The bottom line: Speaking through Mike, an assistant, Lee says that BWT has set aside five dealerships for each of the stops on his national tour, and that such dealerships are trading for $10,000. Interested persons were invited to sign up for more information at the end of his show. After the show, at least a dozen people were crowded around the BWT sign-up table. Barnum was right! What makes Lee's pitch so persuasive that some people swallow all this hokum? In addition to Lee's two flyers, three other items were distributed at the show: (1) The Free American a 28-page tabloid-size "Patriot" newspaper published in Tijeras, New Mexico; (2) A flyer announcing a workshop on "Common Law Living Trusts" and "How to beat the Income Tax system;" and (3) A flyer announcing a talk on "CIA mind control experiments" and "the true goals of the New World Order." These materials appeal to persons who have a deep distrust of government, international organizations, scientists, bankers, oil companies, power companies, the news media, etc. Conservative radio personality Rush Limbaugh classifies these people as "Kooks." They tend to believe in international conspiracies, UFO coverups, mind control plots, etc. Judging from audience response, perhaps some 10 to 20 percent of the attenders were such people -- and it was to them that Lee targeted his pitch. Lee's spiel had the feeling of a revival meeting; four non-stop hours in a hot, packed room, with his voice booming from the loudspeakers, and no break for audience questions. His audience, immersed in Lee's torrent of words, had no time to think, only to applaud. Early on, Lee said that he had been imprisoned without a trial and this, coupled with his boast that he had no technical training, made him appear to be just another "good ol' boy" fighting an oppressive bureaucracy. He said he came from a "non-rich background" and was amazed to find himself worth $50,000,000 (apparently before he went to prison) -- a "good ol' boy" who made good. He asserted that the Government had developed the "World's Most Efficient Engine" for $30,000,000, found that they "couldn't break it," and presumably suppressed it. He railed against the power companies, the banks, the "smokestack economy," the "Illuminati," and the "New World Order," and claimed that he had "options from God." His target audience ate it up. He derided the ozone holes, said that CFC's are heavier than air, questioned how ozone is made, asked how many refrigerators there are at the North Pole, claimed ozone doesn't block the ultraviolet rays that cause cancer, and said that -- anyway -- there isn't direct light from the sun at the poles! He claimed the ozone holes have always been there and were discovered around 1900. He suggested that the current interest in the ozone holes is a reaction to his work using Freon in his energy machines. He also claimed that DuPont's patent on Freon has expired and that that is the real reason for reports on the ozone holes and for developing alternative refrigerants. And his target audience cheered. The show was a learning experience -- but not of new technology, but rather the old hokum of a snake oil salesman. Thanks to John Geohegan, who also attended the show, for his technical advice in preparing this report, and to John and Dave Thomas for editorial suggestions. Due to one Mr. Wade Frazier's insistence that a Yakima newspaper's allegations about Dennis Lee's past encounters with various law enforcement agencies are in error, the NMSR article above about Lee's Oct. 28th, 1999 visit to New Mexico has been REVISED. All references to Mr. Lee's alleged legal misdoings have been removed. NMSR is a science organization, not a legal one, and Lee's legal history is not our main concern. We contend that Lee's incredible claims regarding "Free Electricity" fail entirely on their own merits. We are pleased to present first-hand accounts of Lee's 1996 and 1999 visits to Albuquerque, including physics calculations which show conclusively that Lee's energy claims are mere "smoke and mirrors." Click here to see a website from Dennis Lee supporter Wade Frazier that's supposed to refute Eric Krieg's site, but which doesn't even link to Eric's site!! (In other words, this Lee supporter wants to tell you what to think, but he's afraid to let you think for yourself ...).